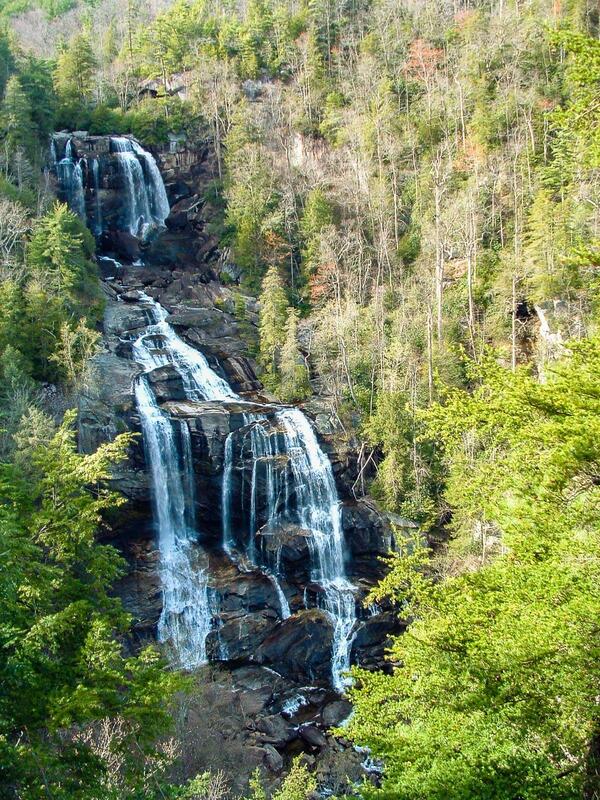 If you could visit only one waterfall in Western NC, this may be the one I'd recommend. The upper drop consists of a short cascade followed by a huge free-fall, with most of the flow on the right but a few ribbons of water also spilling down on the left. After a short run of rapids and cascades, the lower free-fall section begins and it is split as well with most of the water on the right when the water is low (it evens out more during higher flow). It ends in some cascades into a couple of rocky pools. The overall scene is wide, and dramatic, from the overlook. Some consider this the highest waterfall east of the Mississippi River. Whether or not that is true is debatable - it's even debatable as to whether what you see is even one waterfall, considering the short run of rapids between the main drops. The height has been listed in various places for many years at 411 ft. I think this might be some sort of competition with the also-overestimated Hickory Nut Falls, because it's simply not that high. Using recent USGS elevation data, I estimate it to be just a hair over 334 ft. You might round it up to 350 if you're generous and include some of the cascades above and below the lower drop in your calculation. Nevertheless, it's a very scenic and impressive waterfall, with a high water flow - the stream is more like a river than a creek at normal flow. From the intersection of US Hwy. 64 and NC Hwy. 281 in Saphire (east of Highlands or West of Brevard/Lake Toxaway), drive 8.8 miles South on 281 to the well-signed parking area on the left. If you are coming from South Carolina's scenic Highway 11, drive SC Hwy. 130 and drive about 10.4 miles north to the North Carolina border, where the road becomes NC Hwy. 281. The parking area is about 1/4 mile ahead on the right. A fee is charged for parking and walking to the overlook - it was $3.00 per vehicle on my last visit. But you can use the same ticket to visit other National Forest sites in the area, such as Dry Falls, about 25 miles away on US Hwy. 64 west of Highlands. The paved trail leads out of the back of the parking area, past informational signs and a few picnic tables, and into the forest. It passes a wet area/small seep just inside the woods. It's kid-friendly and wheelchair accessible up to the upper overlook. From there, a long set of stairs leads down to a lower overlook. The view is great from both, although a bit more open from the lower overlook. From the lower overlook, a rough trail descends through switchbacks to a bridge over the river and a connection with the Foothills Trail. It is technically possible to rock-hop upriver to the base of the falls, but it's dangerous and (officially) not recommended.